Plus, Medina, North Bend, Tumble Creek and folks who are outfitting their second or third homes in the Suncadia / Cle Elum area in Washington (just about 83 miles southeast of Seattle). Family, in this store’s case, also includes canine family members. When we visited, we met the owners Guy and Nicole, and Max, a helpful technician. And we also met Cody, Sami and Bosley. 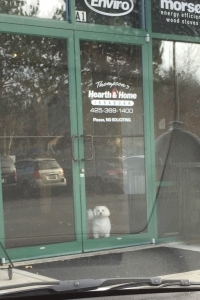 These three small friendly dogs came to greet us, then ambled back to an oversized plush bed comfortably situated in front of the store’s main gas fireplace …outfitted with the latest prototype from Ironhaus: our barn door design. Guy and Tim Campbell, owner & lead designer of Ironhaus, sent pictures back and forth before settling on the final design. This is a unique door in that it rolls open and closed from an overhead set of wheels that glide along a track. The customers are really liking the design. “We’ve had this (main) fireplace on more since the new doors were put on, than we ever have before,” mentions Guy. 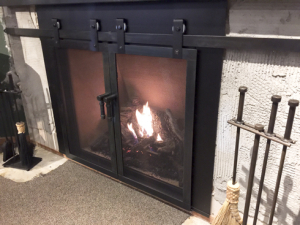 The gas fireplace itself isn’t the most efficient in the store, he shared, but the doors and the flicker of the flame behind the mesh bring people closer and conversations just start. There’s a space about 3-feet above the fireplace that shows the inside of the wall and how the fireplace sits inside the space. It’s been a really good educational talking point, said Guy, who shared he’s considering finishing the rock repair around the sides of the hearth, but leaving the hole open so shoppers have a better understanding of their fireplaces, and their purchase before they buy. This effectively turns a repair project into an opportunity to share more about the fireplace and the customer’s home than they would have gotten by just looking at the outside. There’s a community called Suncadia, located about 90 minutes southeast of Seattle, between Cle Elum and Roslyn, that features resort lifestyle and living. With golf course, lodge and resort. In and through this area, design build pros are creating 2nd and 3rd getaway cabins. The style is sophisticated rustic with modern, yet cozy, cabin comforts inside the stateliness of a lodge. Each home is designed and built with a minimum of two, and up to as many as five, fireplaces for each cabin. Lots to see at Thompson’s Hearth & Home. Please don’t mind the dog toys. Due to the service location, selection and reputation of the store, Guy sees a fair amount of the new Suncadia homeowners. Shoppers have either seen the doors in a neighbor’s home or their design build pro has directed them to look for Ironhaus work by name. “Contractors are building Ironhaus doors into their proposals and budgets,” shared Guy. 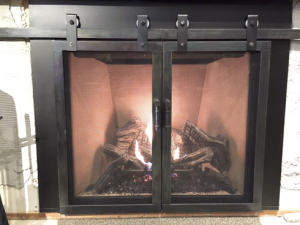 Guy noted that one out of every four customers who come in looking to outfit their new Suncadia homes’ fireplaces are looking for Ironhaus products specifically. “The black copper finish is what we sell most. Two of the four samples we have in house are the black copper finish and people really like what they see …and they tend to buy what they see,” he said. This makes sense, as it’s easier to visualize a finished door inside of a home space, versus trying to project the final look based on a 3” x 6” rectangular flat sample of a finish. In the three years that Guy has been carrying Ironhaus, he’s gone from having one door sample to four, including our latest barn door prototype. Ironhaus toolsets are on their way to Thompson’s Hearth & Home only because of a customer’s request. This wasn’t an item Guy planned on having in stock, but a customer insisted on having a set of tools made to go with her doors. So, they came in for this lady, and Nicole saw them and ordered sets for the store, knowing they will sell well. “They stand apart from anything else we sell,” said Guy. 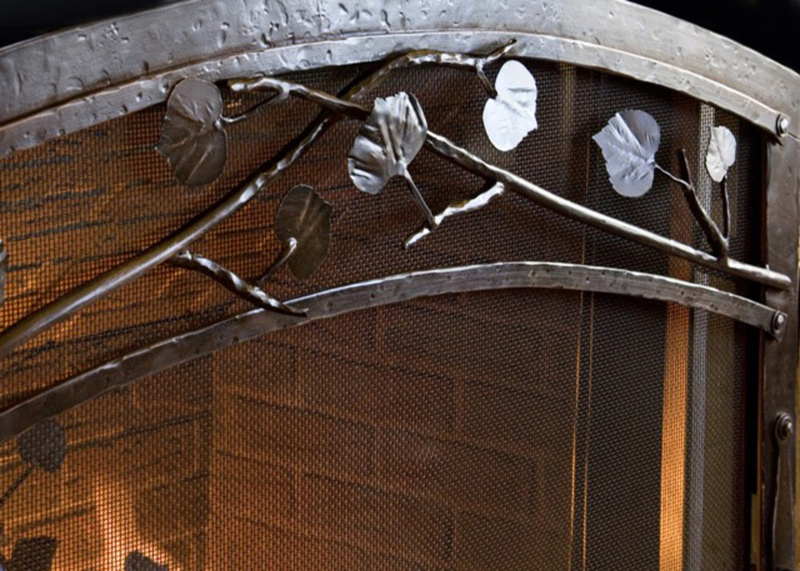 We love partnering with family owned and operated businesses like Thompson’s Hearth & Home. 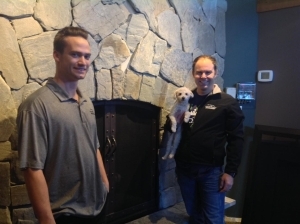 And we encourage all from the Greater Seattle Area who are ready to level up their fireplaces with custom doors to visit Thompson’s Hearth & Home, see our work, pet the pups and talk with Guy and Nicole in person about completing their vision for their dream hearth & home. 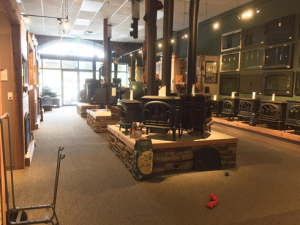 More about Thompson’s Hearth & Home of Issaquah, WA. Featuring Nicole and Guy Thompson, and Rajah the full size & friendly Doberman that’s also in the store some days.